Should I consider secondary developers? No, retain the purity. One man, one mod, ein reich! CityRPG is a mod that has existed since Blockland v8. It has lived over the course of years. It has been developed and modified by more people than I will ever really know. It is a mod that has one of the most convoluted and sordid histories that this game will ever see. Oh, it's also pretty fun. Bum Unemployed Vagabound Unemployed is the default job. It alows you to collect welfare. After 10 welfare checks, you become a vagabond, which allows you to beg for money. Merchant Grocer or Arms Dealer Storekeeper Factory Owner or Profiteer Merchants handle goods. Grocers sell food, Arms Dealers sell ites. Storekeepers can sell either, and vehicles. Factory owners run factories that generate high profit through employees, Profiteers generate consistant profit through investing Refined Plastic and money into auto-generating skyscraper lots. Law Police Officer SWAT Officer Police take care of criminals. They are armed with a Baton for stunning, and Handcuffs for arresting. SWAT Officers are the most lethal. To even be one, you need 50 arrests, 50 kills, and to maintain a Kill Death Ratio of 1:1. Labor Miner or Lumberjack Skilled Laborer Foreman Laborers mine raw plastic from trees and ore bricks. They sell this ore to factories for processing. Skilled Laborers give a small bonus to all nearby unskilled laborers. Foreman give off an even bigger bonus, and the larger the group mining with him, the faster everyone mines. CityRPG has a unique, balanced weapon set. It uses raycasts, has headshot damage, range falloff, and custom models and animations (courtesy of Monty). 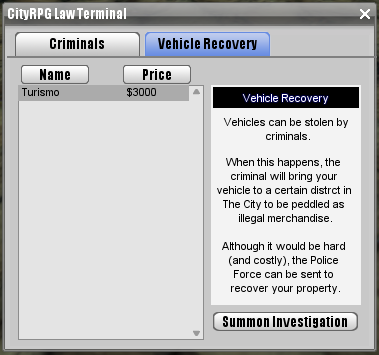 In the old CityRPG, the price of a vehicle would be the price of the vehicle spawn brick. This had no restrictions, and depending on what vehicles the server host had enabled, players could spawn tanks, helicopters, whatever. This is different now. Vehicle spawns are free, but to get a vehicle you have to buy it from a Shopkeeper. 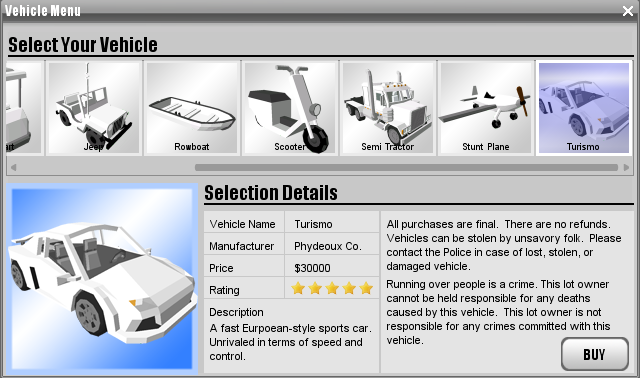 Shopkeepers are allowed to sell vehicles through a Vehicle Sales GUI. 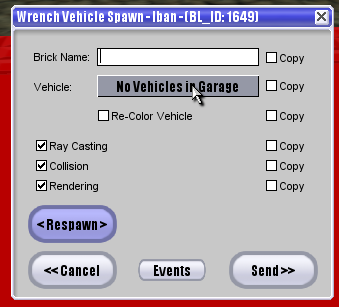 Buying a vehicle causes it to appear on the modified Vehicle Spawn Wrench Dialog. As a result, vehicles you own can only be spawned on your property, not another player's. Vehicles can be locked and unlocked, but they can also be picklocked and hijacked by the City's villains. If your vehicle is sold illegally, you're out of luck. You'll have to find your local Police Department and pay to have them find it. This is about 10% of the original price paid. Without this enabled, you can do no evil. Shooting people does no damage, running people over halts your vehicle miraculously, stray gunfire does not damage other people's property, and so on. You can defend yourself safely, however. Gunfire towards aggressive criminals will work just fine, and police can safely tackle spree killers in a crowd without risking their own welfare. Enabling crime will allow you to whatever you please. Incurring demerits of any form will force you into Crime mode. Demerits also function differently. Crimes can either be blatant (automatic demerit incursion), witness only (innocent or police must be in viewing distance of the crime), or they drop a clue. Clues can either be visible or invisible, depending on the crime. 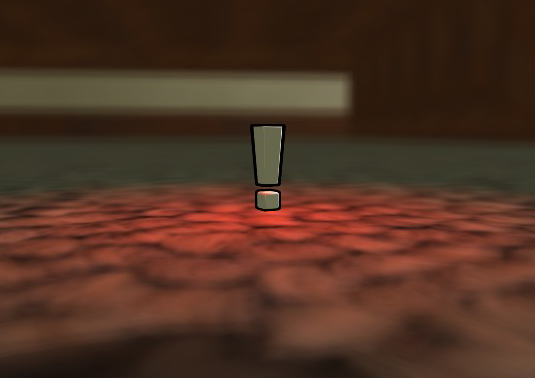 If a cop touches a clue that is visible, it incurs demerits on the player. If a Law Enforcer uses his magnifying glass in the vicinity of a clue, it becomes visible. If a civilian uses his Cellphone in 9-11 mode near a clue, visible or not, it incurs demerits on the perpetrator. Clues are dropped by all sorts of events and last for different periods of times. Clues tend to collect around shady lots were lots of illegal activity happens, but drop where people are shot or killed, where bricks are destroyed with a pick-axe, and so on. Blockland will have its maximum population at 0100 UTC, so elections will begin at 0000 UTC and end at 0103 UTC, or 6pm - 7pm Central Standard Time. An in-game week is 1 hour, 3 minutes. A mayor will remain mayor until voted out of office, or assassinated. A mayor's natural term will be 24 hours, starting from the end of his electing vote until the end of the next election period. A 6 months in-game is 25 hours, so this is just under half a year. Getting elected is a battle of strategy, and money. You pay into campaigning. A level 1 campaign costs $100, and each level thereafter is 150% the price of the last level. Level 2 is $150, and so on. The top 4 campaigners will appear on the ballot box next to the incumbent mayor. Incumbents have no need to campaign, their popularity will be dependent on their actions as mayor. Mayors can be re-elected as many times as the public is willing. Letting people know what you're about and securing votes with public expeditions is just as important, however, as some people may give you money to help with your cause. Simply being on the ballot is not enough. 1. Betray the public and incur demerits. By default, the Mayor is a Do No Evil position, and cannot ever hijack vehicles or do other sorts of harm to his or her civilians. However, the Mayor can embezzle money and buy vehicles with the government treasury. If a police officer is astute and willing enough to track your actions, you will lose the faith of your people. 2. Being assassinated. Political Assassinations are the most heinous of crimes, as they eliminate a person put into position by the people themselves. Because the punishment of assassination is so high (life in prison without possibility of parole), it's unlikely anyone will ever want to kill the Mayor. However, if taxes are too high and you pardon too many prisoners, someone might just be tempted. If a mayor is removed from office for any reason, the election will occur at the next natural election period. In the time between removal and vote, there will be no governing body. The city will have to take care of itself. CityRP is based off the mod for Garry's Mod called "DarkRP." It is a mod that is based off a mod for a mod. Shopkeeper, which could spawn items. Police officers, which could arrest criminals (the only crimes back then were Assault and Murder). Civilians, which didn't do anything. Every 5 minutes, a tick would happen. People would get income based off their job. Civilians earned $25, Police earned $50, Shop Keepers had to make money by selling items. These were the simplest times of the mod. The original developers of CityRP were Jookia and Boltster. Jookia was the main contributor of code, and although Boltster did make attempts to help, Jookia's extreme concern for the formatting of his code would cause him to want to integrate Boltster's contributions line-by-line. The result is, submitted progress would take a week to appear on the main server. This did not change when I, Iban, joined the team and began to add to the pot as well. The rate at which my code was being added was upsetting, so instead of just working and submitting progress to Jookia, I hosted my own server. I called my server "[Iban] CityRPG", which was different in only one aspect: The name had a G on the end. Jookia never liked this, saying that Blockland was the game, CityRP was the roleplay. Our relationship crumbled extremely quickly, and after a week of adding on to CityRP, I had a mod that was getting much more sophisticated than Jookia's. I had added two jobs: The Thief and Bounty Hunter, adding more crimes and ways for people to stop crime. In jest (or maybe not), I renamed the server "[Iban] Better CityRPG". Jookia did not like this, and he asked me to stop working on the mod and delete my copy of the add-on. I declined, and CityRPG was born. Jookia and Boltster continued to develop parallel with me. However, because Jookia was slower at adding new features, and Boltster's rate of contribution was almost none because of how Jookia needed to integrate his code, I quickly won that race. Eventually, my server was poplocked at 16 players at almost all times, while Jookia's 32 player server dwindled with inferior numbers. Jookia gave up, and posted CityRP publicly to get back at me. I remember having a conversation with him, where he was going on about how he had won, because now CityRP was not special. Anyone could run it. He intentionally killed his own mod to have revenge. This did not work as expected. Even though there were many clones of CityRP floating about, they all lost popularity and paled in comparison to the mod I was running. But one day, I just got bored. I looked at all I had made and decided, "no more." I shut down the server and disappeared for months. In that time, someone did take my place. That was Diggy. He had attempted to modify his copy of CityRP through scripters in the USSR Clan, and although progress had been made, it was slow and insubstantial. Diggy himself did not know how to script. However, his ability to build awesome cityscapes and layouts struck a chord in me. I had great faith in Diggy, so I gave him CityRPG. To spite him, I began hosting again after a few months, developing and fixing what he had made, but better. This is when I met three people. This group were frequenters of Diggy's MetropolisRP (I think he was Wentworth at this point), but they once visited my server to see what it was. This is when they were all banned from Diggy's server for the reason "Iban Lackey." None of them knew me, we didn't talk, but Diggy had been using RTB to check who was in my server, banning almost everyone who joined. Upset with Diggy Wentworth, the four of them spoke to me and we just clicked. Pedgi owned a business level Internet connection and a server capable of holding 48 players. Spacefar1 was good with graphics. Striker150 was a college student studying 3D modeling. Wentworth had inadvertently dropped the three best people I could have hoped for right into my lap. This was the start of the GUI, one of the first of its kind. The only mod that had a way to require a GUI. I was no longer bound to the ground with center prints and bottom prints, the sky was the limit. CityRPG v2 was born, and it destroyed Wentworth's server population after only a few weeks. Wentworth had fallen the same way that Jookia had, but life takes precedent. Striker was swamped by college material, Pedgi and Spacefar and Shark were socially active and extremely charismatic. And I was bored, again. CityRPG v2 faded away for the same reasons it had before. I was tired of doing the same thing every time I got on my computer. They wanted to see more, but I did not. There was some sort of elusive crash bug that would cause the server to die at complete random, sometimes every day, sometimes an hour into hosting. I could not fix it. Building upon Jookia's design for 2 years had finally come to its end. 25,000 lines of code over a dozen or more files, and CityRPG v2 had died. How about you write a newer, better version for people to take and modify to their liking? Because the current version is stuff. It has been rewritten from the bottom up. I will not release it. Good, you're going to be hosting it though? Right. The server will be hosted under this ID. Cool, what will be different about this city RPG, because that old one was bad.. no offense. A lot more thought has been put into the features. Things are more balanced. There is experience in job branches, along with education and the like. Nothing exists because I felt like richarding around with code. It's more refined. It's hard to explain how vast the improvement is. I'll have to get it playable for that. Though, if you did not like the basic concept of CRPG, you wont like this one, either. Will burning babies be an option in the next release? we should make a museum. I still have jookia's JookiRPG.zip and stuff. You also forgot DarkLight's CityRP, if you consider that. And Wicked's. But hey. Thats awesome that it's going under the CityRPG's Server as a name. Thats' gonna be sweet. When will next beta be? When are you gona host this? I feel sorry for what Iban have been through in the CityRP(G) swamp. I tried myself and some of you might remember CityRP v2, LifeRP and RP Content. It was fun making those and I don't regret making them, even if some might give a wrong idea of how you really should script a mod. It is so bad that Iban got so much haters on him, not only because of how he replies to people. Even Badspot told him that everything he said could be taken negative(Correct me if I'm wrong). Don't take me wrong, though. Even I fell for it, but regret doing it. Not only because he have better arguments than me, but also because I was mostly(If not always) ignorant to a person that had more potential than I had in CityRP(G). I took him for granted because I didn't liked him to have all the fun of creating a mod that gave so much for Blockland. Hats off for you, Iban. Brian Smith how do YOU have Wicked's? Glad to hear this is still being worked on and improved. Also glad to hear this one won't be released.